Next in the schedule for a revamp is British Airways’ lounge at New York’s JFK Terminal 7, along with improvements being made to the customer experience at check-in. Next year Aberdeen and Rome’s lounges will also be revamped, and Geneva will be expanded. Further investment is then planned in San Francisco, Johannesburg and Chicago and Heathrow’s other lounges will be refreshed over the next few years. Finnair will continue to grow its operations during the 2018-2019 winter season with additional capacity added to existing routes in Lapland, Russia and the Baltic countries. In addition, Stuttgart and Lisbon will become year-round destinations. During the 2018-2019 winter season, Finnair will serve both Kittilä and Ivalo, two of the most popular winter destinations in Finnish Lapland, with additional daily non-stop flights. In addition, schedules for flights to Lapland airports have been aligned for more convenient connections and increased options for customers. Finnair’s direct flights to Lapland from London Gatwick, Paris and Zurich will also continue for the 2018 winter season. Stuttgart and Lisbon, two new destinations for Finnair starting on April 23 and June 1 respectively, will continue during the winter season and become year-round routes for Finnair. Stuttgart will be operated as a daily flight and the Lisbon flight will be operated three times per week. As previously announced last spring, Finnair’s flight to Nanjing, China is also continuing as a year-round route with two weekly frequencies during the winter season. Finnair is adding a new daily overnight flight to Moscow, which will greatly improve connections for Russian passengers travelling to Europe and North America. Additional capacity is also being added for St. Petersburg as the route will be operated with a larger jet aircraft. With this change, Finnair will be adding approximately 600 additional seats per week on the St. Petersburg route. Both Moscow and St. Petersburg will be operated with three daily frequencies. For the Baltic region, Finnair is also adding a weekly frequency on Sundays for both Riga and Vilnius. Finnair will operate 19 weekly flights to both destinations during the 2018-2019 winter season. Courtesy: Austrian Airlines – Michele Pauty. Austrian Airlines is looking to hire 300 new flight attendants to be stationed in Vienna for the year 2018. The airline is forging new paths in the application process. Prospective candidates can choose whether they apply online at www.austrianairlines.ag or whether they would prefer to come directly to a live casting or personally audition for a job. The live castings will take place in Graz on November 17, 2017 and in Linz on November 18, 2017. 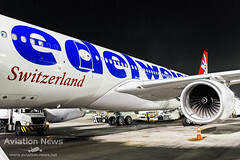 The underlying reasons for Austrian Airline’s efforts to hire new employees are the expansion of its flight offering, both on its long-haul routes and in bilateral flight traffic to neighboring countries and ongoing staffing. This year Austrian Airlines already added 350 new flight attendants. Requirements for candidates include a very high customer focus and service-mindedness, a very good command of German and English, a minimum age of 18, successful completion of their school or vocational school education and finally, fulfilment of military or civilian service obligations in the case of male applicants. The annual gross salary is 21,462 euros plus overtime and expenses. From the thirteenth year of service, the base annual salary is around 30,000 euros plus overtime and expenses. Anyone who is interested will find detailed information about the vacant positions and how to register for the selection process at www.austrianirlines.ag. In total, Austrian Airlines has a staff of around 6,700 employees, including about 2,600 flight attendants. Austrian Airlines is expected to increase the number to 2,800 flight attendants next year. Boeing and Air China today (November 03th, 2017) celebrated the delivery of the airline’s first 737 MAX 8. 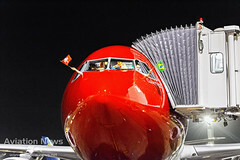 China’s national flag carrier is the first airline in the country to receive the 737 MAX. Customers throughout China will take delivery of nearly 100 737 MAXs by the end of next year. United Airlines today announced the retiring flight of their 747 fleet. The farewell flight will take place on November 07th, 2017 as “UA747” from San Francisco (SFO) to Honolulu (HNL). 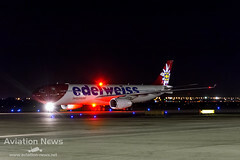 The aircraft is scheduled to departure from San Francisco International Airport at 11:00 AM* and land at Honolulu International Airport at 02:45 PM*. By coincidence (or not) this flight has the same route which United made when the airline performed its first Boeing 747-100 commercial flight on July 23th, 1970. The airline plans to make a remarkable throwback flight with the intention to recreate the United’s first 747 commercial flight. Customers, employees and invited guests will be present. The travelers can expect a 1970s-inpired menu to retro uniforms for flight attendants to inflight entertainment befitting of that first flight, passengers will help send the Queen of the Skies off in true style. With the same name of United’s first 747 aircraft, this flight will be called “Friend Ship”. Tickets for this upcoming United 747 goodbye can be purchased now at United’s website or via its app. Seats in the traditional “hump” area of the aircraft (upper deck) will not be sold since the airline will give for all the guests the opportunity to spend time in this iconic space. For customers with a seat in United Polaris First Class or United Polaris Business Class, the airline will hold a drawing that will happen at the gate prior to boarding for an opportunity to occupy one of a select number of seats in the upper deck during the last journey of United’s 747. This farewell journey will start at 09:00 AM* at San Francisco International Airport, featuring a Boeing 747 gallery, remarks from United employees and executives, as well as refreshments. Upon landing in Honolulu, local employees will welcome the Queen of the Skies with final festivities to finish this magical day. Everyone is encouraged to use the #UA747Farewell hashtag in social media posts. United Airlines has been one of the driven forces of the 747 Program, since the beginning the airline has made several orders and has bet on the 747 performance. With acquisition of the new Boeing 747 variants over the years, new routes to Europe, Asia and Oceania were possible and the airline made a record. On 1988, an United Airlines Boeing 747SP-21 took off from Seattle Tacoma International Airport (SEA) towards to Athens (Greece), the aircraft made one stop and then took off again towards to Taipei (Taiwan), before returning to Seattle on the following day. This flight was called “Friendship One” due to the donation of the entire profit of this flight to the Friendship Foundation, a San Francisco-based charity organization who donates millions of dollars to terminally-ill children. It has also marked the first two-stop round-the-world flight, Neil Armstrong and Moya (Bill Lear’s widow) were onboard. The precise record is a flight time of 36 hours, 54 minutes and 55 seconds and a distance of 23.125 miles. 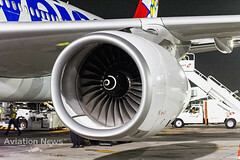 United is making path on their fleet for more state-of-the-art and eco-friendly aircraft like the Boeing 787 Dreamliner, Boeing 777-300ER and the Next-Generation 737’s. Upcoming aircraft as Airbus A350 XWB (which got an order update early September) and the Boeing 737-10 MAX (historic order of 100 units and the worldwide largest operator of this aircraft variant) will also help together with the Eco-Skies initiative the airline with this mission. Effective immediately (since September 06th, 2017), Austrian Airlines passengers can book a seat in the new Premium Economy travel class for flights starting on March 6, 2018. The centrepiece of the new Premium Economy Class is a new seat providing passengers with more comfort on their journey compared to regular Economy Class seats. The first Boeing 767 will begin to be refitted today. All eleven long-haul aircraft in the Austrian Airlines fleet will gradually be refitted to include the new travel class. The twelfth long-haul aircraft to be acquired by Austrian Airlines in the spring of 2018 will also be equipped with Premium Economy. “The new Premium Economy Class is an important milestone in our strategy aimed at linking the issue of individualization with quality. The customer can individually choose the travel class according to her or his needs, whether the preference is to fly in a price conscious manner in Economy Class, treat oneself to a little more service and comfort in Premium Economy or luxury travel in Business Class”, says Austrian Airlines CCO Andreas Otto. In particular, the new Premium Economy Class is designed to appeal to passengers who want to afford more service and a higher level of comfort on flights to their holiday destinations as well as price-conscious companies whose employees should travel in comfort on business trips. The Premium Economy seat produced specially for the Lufthansa Group is supplied by the aircraft seat manufacturer ZIM, and provides passengers with plenty of legroom based on seat spacing of up to 97 cm or 38 inches. Additional footrests take the strain off the legs on a long flight. The central armrest with fold-out table between the seats and a personal, broad armrest for every passenger enables more privacy and more room on the side. In addition, every seat is equipped with its own power outlet and USB port. The new Premium Economy Class offers much more than a considerably more comfortable seat. Passengers in the new travel class can check in two pieces of luggage at no charge, each with an allowable weight of up to 23 kilograms before being pampered on board with culinary delights. Travelers conveniently select their favorite food from the menu card, and the food is served on china dishware. Moreover, every passenger in this travel class is given a small amenity kit with useful travel accessories to ensure a restful stay on board. Premium Economy passengers enjoy the extensive in-flight entertainment programme on large 12-inch touchscreen monitors. Flights in Premium Economy Class can be booked as of now, via Internet, on the Austrian Airlines booking hotline at 05 1766-1000 or at a travel agency. Premium Economy fares range between Business Class and Economy Class. 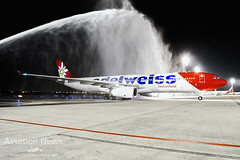 For example, the round-trip Vienna-Bangkok-Vienna flight is available starting at EUR 839 including taxes and charges.